For several days, and again on this week’s Sunday morning shows, President Barack Obama’s spokespeople, both at the White House and at the Obama campaign, have claimed that he called the Benghazi attack “terrorism” from the outset, in his Sep. 12 address from the Rose Garden. The media have pushed back, noting that the White House rejected terrorism as an explanation in the days that followed. But there is an even simpler reason to reject the Obama camp’s explanation: it is a demonstrable lie, as a reading of Obama’s actual remarks instantly reveals. Obama mentioned the word “terror” once in his Sep. 12 statement: “No acts of terror will ever shake the resolve of this great nation, alter that character or eclipse the light of the values that we stand for.” But the context of that statement suggests strongly that President Obama was referring to terror in general, not specifically to the attack on the U.S. consulate in Benghazi or the violent demonstrations at the U.S. embassy in Cairo. Obama did use the word “terrorists” in his Sep. 18 appearance on the David Letterman Show. But he used it to claim that the “terrorists” had acted only in response to the anti-Islamic video, taking advantage of public outrage against it. As we now know–and as the administration (at least the State Department) knew at the time–there had been no public demonstration of outrage at the U.S. consulate in Benghazi. That marked the beginning of a subtle distinction that the administration attempted to make for several weeks: the difference between terrorism as an action (or reaction), and terrorism as an independent motive or cause. In other words, the attack was “terrorist” because it was violent–but not necessarily because it was carried out by terrorists. Carney did not allow that the attack had been premeditated, leaving the administration enough wiggle room to continue to blame the video–as President Obama subsequently did again, five days later, at the United Nations on Sep. 25. In his speech, Obama failed to use the word “terror” or “terrorism” to describe the attack. 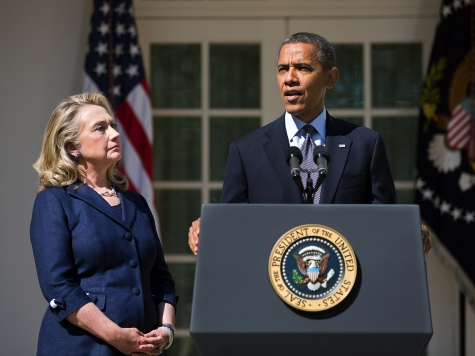 In the days that followed Obama’s speech, the White House and the State Department gradually and grudgingly acknowledged the reality that the attack in Benghazi had nothing to do with the video. Last week, on Oct. 9, the State Department finally stated unequivocally that there had been no protest outside the U.S consulate prior to the attack. So the Obama White House, and the Obama campaign, had to change their story again. Having relied for weeks on the imaginary distinction between terrorism as a reaction to the anti-Islam video (a meaning that they had embraced), and cause of the attack (a meaning that they had denied), they began pretending that President Obama had referred to terrorism in the latter, broader sense as early as Sep. 12. Meanwhile, the State Department–which presumably reports to Obama at some level–continues to refuse to call the attacks “terrorism,” treating the word as a kind of value judgment rather than a statement of fact. It is not necessary to examine the whole timeline of events to understand that Obama and his spokespeople are lying yet again. Obama’s own words on Sep. 12 are proof enough. He placed the 9/11 attacks in the context of global outrage against an obscure anti-Islam video–making sure to condemn it–and only addressed terror in an abstract sense, never as a description of, or a cause of, the attacks themselves. Obama and his minions lied more than a month ago, and they are lying to America still.